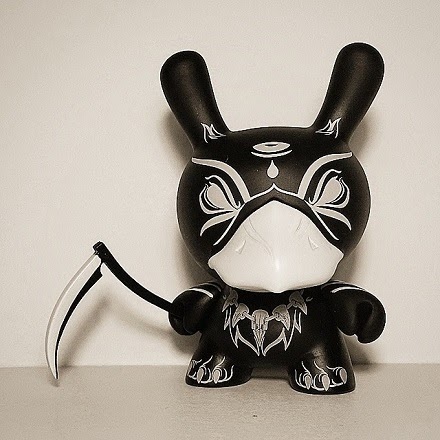 Obviously Kidrobot recognized that Colus straight out destroyed it with his 8-inch Dunny "The Hunted," having now invited him to join the phenomenal team of artists assembled for their "Art of War" series. Combining his distinct and strictly black and white approach with powerful graphics, the result is an imposing figure he has dubbed "The Harvester." Read more about the creative process behind this piece on Colus' Behance page, and you can purchase the "Art of War" blind boxes through the Kidrobot online shop.